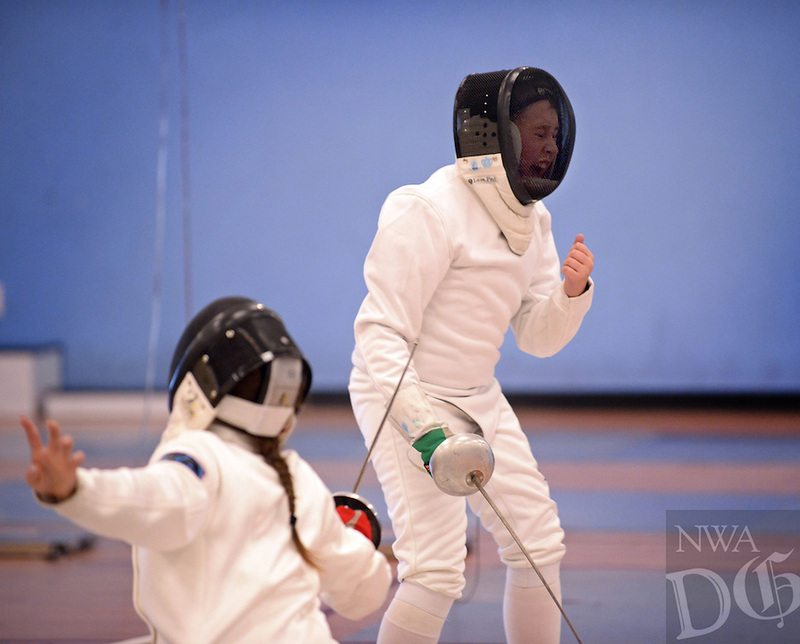 Henry Stone (right), 12, from Oklahoma Sport Fencing in Mustang, Okla., celebrates a point against Amelia Palmer, 11, from Texas Fencing Academy in Austin, on Sunday Oct. 18, 2015 in the Y12 epee semifinals during the 3 Swords Regional Youth Circuit fencing tournament at Northwest Arkansas Fencing Center in Bentonville. Stone won the match 15-14 and placed second in the Y12 epee event. The three-day tournament was part of a qualifying path to youth Summer Nationals next year in Salt Lake City, Utah, and proceeds benefitted the Northwest Arkansas Fencing Foundation, the non-profit wing of the Northwest Arkansas Fencing Center dedicated to helping under-served and at-risk youth age 6-18 through the sport of fencing.